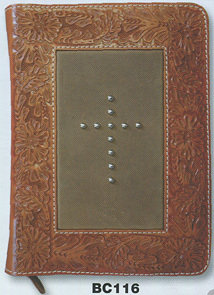 Christian Cowboy leather bible covers. What do you do when your favorite Bible, the one you have noted, marked, highlighted, and all, is about to fall apart? It is the "Word" of God, spoken to you over time, at times you needed it most! You get a great leather Bible Cover, and "keep on trucking!" These covers are just the right size for Study Bibles, and some extra note papers. I've been carrying mine for over four years and get lots of complements. This might be the perfect gift for your buds, bros, & sisters in Christ, because it is such a conversation piece. Great for starting into your Matthew 28 Commission. OK, somebody let me know they are appropriate protective covers for other bits of literature too. The zippered closure helps keep all your notes in place. These beautiful bible covers are a sure way to keep the good book look even better. 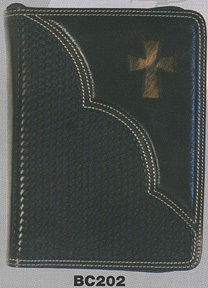 Each cover is made with quality leather to ensure durability. The hair-on calf hair, featured on some of these covers, is distinctive and gives the natural aire of the messages inside. Even the decorative conchos and studs are made of materials to hold their shine for a long time. Who knows, your cover may last long enough to become an heirloom. They make great gifts for your fellow Christians and loved ones. If you are on dial-up, run touch up something. It will take a little while for this pic to download. You may need to hit the refresh button too. On High speed connections, the wait is not too bad. We chose to offer the whole collections as shown to us by Western Fashion Accessories. Enjoy! Cultured Cowboy has watched the selections from Western Fashions mature into some of the best Western leather good made. Dreams do come true. This company has grown into a reliable, viable, supplier in the last 30+ years. All are well worth the investment to keep cherished pictures and valuable papers secure and safe. Be sure to check all the similar collections from the links below. Hand Tooled Floral pattern of Natural leather with Black highlights to make the tooling jump out. 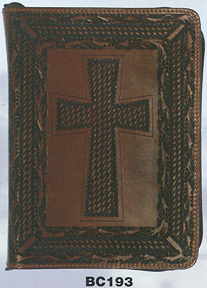 Black leather cross is stitched on light brindle calf hair. Zippered closure. 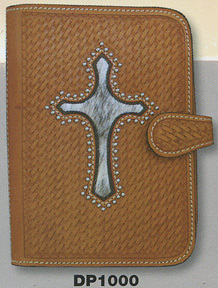 10.5" x 7 1/2" x 2"
Distressed Brown cover. Dark Brown Basket Tool insert with inlayed Calf Hair Cross. Nailhead spots. Zipper closure. 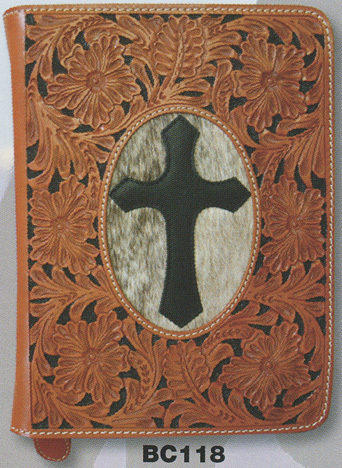 10.5" x 7 1/2" x 2"
Floral Tooled Natural leather cover. Distressed Brown insert with Nailhead spots in shape of cross. Zipper closure. Dark Brown Basket Tooled. Three Inlayed Brindle Calf Hair Crosses. Zipper closure. Med Brown Brindle Calf Hair. Hand tooled Basket Corners and Cross. Zipper closure. 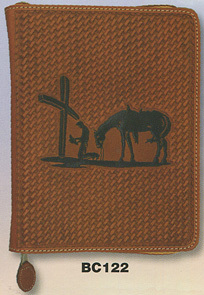 Basket Stamped Bible Cover with the Praying Cowboy, Praying Horse &Cross tooled in the center. Zipper closure. Hand Tooled Floral Pattern with Black dye highlighting the natural leather. 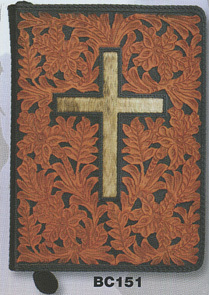 Inlayed Calf Hair Cross. Nailhead stud accents. Zipper closure. 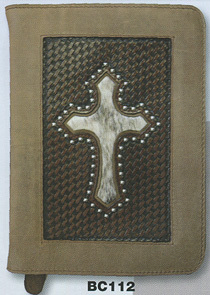 Cultured Cowboy has Value Priced these leather book covers so more can be afforded. AND, If you order 2 or more, Take another 5% off these low prices! Hand Tooled Floral Pattern with Black dye highlighting the natural leather. 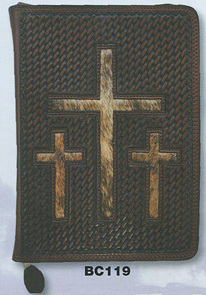 Inlayed Calf Hair Cross. Zipper closure. 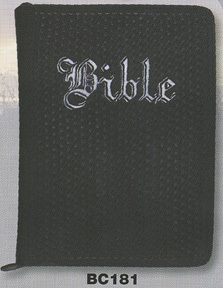 Black Basket Stamped Bible Cover with Old English Bible tooled into the front. Silvery-white dye. Zipper closure. Border Basket Tooled with matching center Cross. Zipper closure. Black Basket Stamped Lower with top grain upper corner. Brown Brindle Calf Hair Cross and double stitching trim. Zipper closure. Day Planner. Hand Tooled Basket. 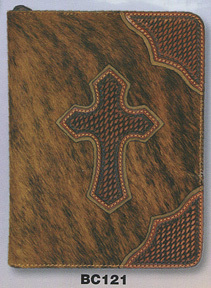 Inlayed Calf Hair Cross. Nailhead trim. Flap closure. 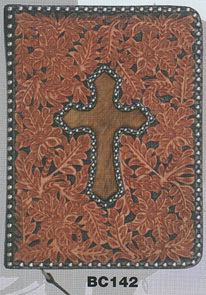 Smaller Bible Cover. Hand Tooled Basket Tool. 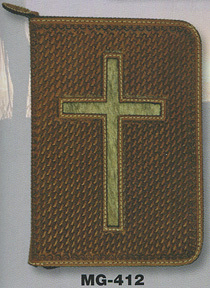 Inlayed Calf Hair Cross. Zipper closure. 8" x 5 1/2" x 1.5"